Sold by Acfun-AU and Fulfilled by Amazon. Gift-wrap available. The Autobots and Decepticons use Prime Masters to wield the incredible powers of the most legendary bots in the universe: the Primes. Prime Masters carry the spark of a Prime. This all-in-one Predaking Combiner set includes 5 Voyager Class Predacon figures: Divebomb, Headstrong, Rampage, Razorclaw, and Torox. Sold by Acfun-AU and ships from Amazon Fulfillment. Predaking is the most fearsome Decepticon Combiner. The 5 Predacons who combine to form Predaking merge their physical and mental capabilities into a whole that is exponentially greater than the sum of its individual parts. The result is a predator of unrivaled power: a tracker, hunter, and destroyer who stalks the universe as the perfect weapon. It's no wonder that Predaking was voted into the Transformers Hall of Fame as the fans' favorite Combiner. Bring home the ultimate Decepticon weapon with this 5-figure Predaking Combiner set. 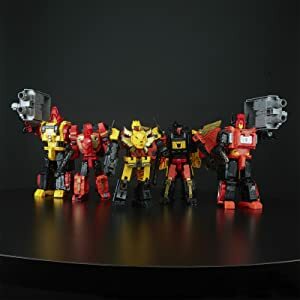 This all-in-one Predaking Combiner set includes 5 Voyager Class Predacon figures: Divebomb, Headstrong, Rampage, Razorclaw, and Torox. 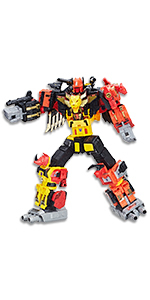 The 7-inch scale figures convert from robot to beast and combine to form a menacing Predaking figure. The Predaking Combiner stands 18 inches tall and is the biggest in the Power of the Primes lineup. 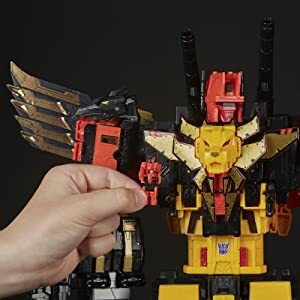 This Titan Class Predaking figure comes with a special edition Onyx Prime Prime Master figure only available in this set. 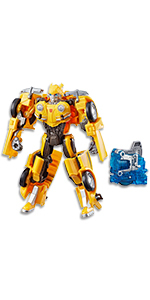 Insert the Prime Master figure into the included Onyx Matrix accessory, lift the lion head on the Predacon figure's chest to insert the Matrix, and imagine Predaking wields power beyond imagination. Other Prime Master figures also fit inside the Matrix. Additional Prime Master figures are each sold separately. Subject to availability. The Autobots and Decepticons use Prime Masters to wield the incredible powers of the most legendary bots in the universe: the Primes. 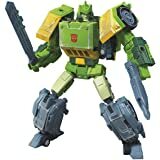 Prime Masters carry the spark of a Prime, allowing them to share a Prime's godlike ability with other bots. Now the legendary bounty hunter Predaking can make these powers his own. 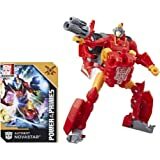 With the power of Onyx Prime in his spark, he soars into the sky to wipe his enemies from existence. Predaking is the most fearsome Decepticon Combiner. The 5 Predacons who combine to form Predaking merge their physical and mental capabilities into a whole that is exponentially greater than the sum of its individual parts. The result is a predator of unrivaled power: a tracker, hunter, and destroyer who stalks the universe as the perfect weapon. It’s no wonder that Predaking was voted into the Transformers Hall of Fame as the fans’ favorite Combiner. Bring home the ultimate Decepticon weapon with this 5-figure Predaking Combiner set. This all-in-one Predaking Combiner set includes 5 Voyager Class Predacon figures: Divebomb, Headstrong, Rampage, Razorclaw, and Torox. 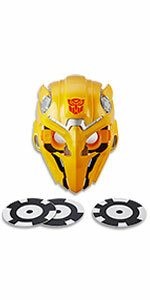 The 7-inch scale figures convert from robot to beast and combine to form a menacing Predaking figure. 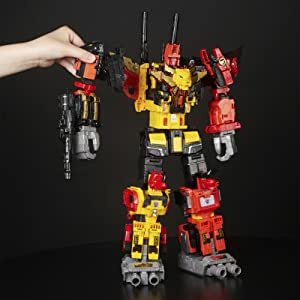 The Predaking Combiner stands 18 inches tall and is the biggest in the Power of the Primes lineup. 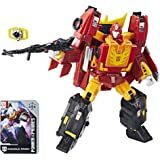 This Titan Class Predaking figure comes with a special edition Onyx Prime Prime Master figure only available in this set. 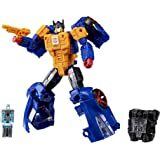 Insert the Prime Master figure into the included Onyx Matrix accessory, lift the lion head on the Predacon figure's chest to insert the Matrix, and imagine Predaking wields power beyond imagination. Other Prime Master figures also fit inside the Matrix. Additional Prime Master figures are each sold separately. Subject to availability. The Autobots and Decepticons use Prime Masters to wield the incredible powers of the most legendary bots in the universe: the Primes. 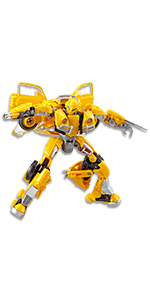 Prime Masters carry the spark of a Prime, allowing them to share a Prime's godlike ability with other bots. Now the legendary bounty hunter Predaking can make these powers his own. With the power of Onyx Prime in his spark, he soars into the sky to wipe his enemies from existence. 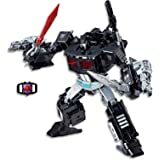 Transformers Toys Generations War for Cybertron Voyager Wfc-S38 Autobot Springer Action Figure - Siege Chapter - Adults & Kids Ages 8 & Up, 7"
First, one of Razorclaw's rear paws popped off at some point in shipping. Not a deal breaker as it can easily be popped back in. The problem is that it's quite loose thanks to that, and frequently wants to flop around wherever it wants. Second (and hysterically also on Razorclaw), his rear legs have little panels that flip over depending on his form. The problem is that one of them was installed backwards so the wrong side was facing out when he was in his beast form. Again, simple fix by popping the part out gently and flipping it over to the correct side, but a bit irksome. 4.0 out of 5 starsGreat overall, but does have QC issues! Excellent figure in combined mode, however I must point out a few quality control issues that are by no means Amazon’s fault, but Hasbro's. My first order arrived without a sticker sheet. 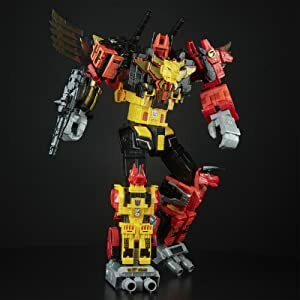 I did notice the character Rampage having a very loose connecting joint, that would have made it near impossible to give it any pose ability when combined in Predaking form. My second attempt had the sticker sheet, but came with 2 Headstrong characters & no Torox! Third time was the charm almost. Sticker sheet, all characters, however Rampage joint was loose again. I simply swapped it from the decent one from the second order. Overall very good looking once he’s combined. While suffering from weak individual modes on their own when combined the Predacons stand tall as the might Predaking. A large and imposing figure, I have only two major complaints. The first is the sticker sheet, as I feel it would make more sense to already have the decals and the like painted on for the price he's at. The second is Rampage. 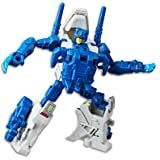 My figure suffers from an error I cannot seem to fix where one of his legs doesn't lock together with the other not only making him incapable of going into tiger form, but also making it impossible for him to properly hold the hand for his arm mode. A glaring disappointment in an otherwise solid figure. 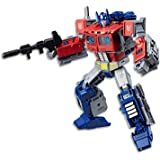 As a collector of the Power of the Primes line, I was very pleased to obtain this Titan Class figure... or should I say set of figures. 5 Voyager Class Predacons that combine into Predaking. Instructions make it easy to discover how to transform everything, and the set of stickers included add to the impressive detail that you can see just by examining the figures. This one might be expensive, but worth the buy. 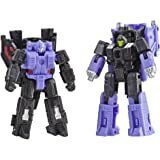 To put in perspective, a Voyager Class figure can cost anywhere from $25 to $40 a piece, a Prime Master usually $5 to $10 and this set is around $170 on average, decently priced for five Voyagers and a Prime Master. Yes, the exclusive Onyx Prime is icing on the cake. 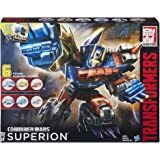 What is important is that this is a worthy buy-well made, easy to assemble, has an exclusive Prime Master, and is nicely priced. 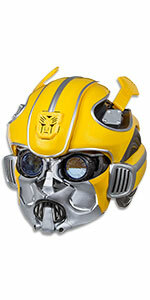 A must buy for any Transformers fan. Bought this for my son and he has no disappointment. I’m a little put off by the quality of the product. 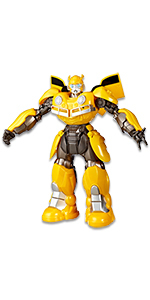 The transforming robots are chunkier and have cheaper plastic than most of them. 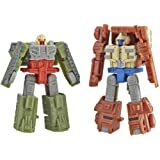 To be a combiner, two of them have giant leg pieces that inelegantly add bulk to both robot and animal mode. You can enhance the look with stickers, which does take me back to the 1980s. The bots themselves are oversized for my son other bots. It’s weird. Again, he won’t look a gift transforming robot horse in the energon intake, but this is still a less than stellar toy.